It was a busy day, and I was up to my ears in emails. As the afternoon wore on into evening, my husband and I desperately needed to figure out dinner. That’s when I reached for a new book, Nourishing Broth, that was recently sent to me for review. I thumbed through it, and landed on a recipe for Pan-Roasted Chicken with Cream Sauce. I showed it to my husband, and he headed to the kitchen to make it. It’s wonderfully simple, but also elegant, too – combining cream with sharp Dijon-style mustard and fresh tarragon. My husband tucked the seasoned chicken into the oven, roasted it, and I pulled it from the oven later, finished the sauce and served it over potatoes with a side of steamed broccolini. Simple, and lovely. The recipe is one of many, including a few contributed by me, to the book Nourishing Broth written by Sally Fallon Morell and my friend Dr. Kaayla Daniels of Naughty Nutritionist fame. Nourishing Broth weaves science, health and nutrition with recipes all focused on homemade broths and stocks. The first several chapters of the book focus on the healing powers of broth, including how and why traditionally prepared, protein-rich bone broths can play a role in skin health, wound healing, digestive disorders, infectious diseases as well as supporting athletes. The science in support of bone broths and stocks, as outlined in Nourishing Broth is extensive – and helps to explain the mechanisms by which a nourishing mug of bone broth can support gorgeous skin, healthy digestion and general health. Once you’ve worked your way through the science in the book, it’s time to try your hand at the recipes – wholesome and nourishing recipes, most of which were contributed by long-time lovers of broth. Broth has long been one of my favorite foods, and I often begin my mornings with a spiced butter tea or a mug of homemade bone broth sprinkled with salt, chopped garlic and flat-leaf parsley. It’s easy enough to make at home and marvelously inexpensive, but for those who have neither the time nor interest in making their own, you can also buy long-simmered bone broth online as well. We always keep a bit tucked away in the freezer or the fridge. About twice a year, when the ranchers near our home cull their flock, we order at least a dozen whole chickens. Our farmers process them, and we tuck them into the freezer – pulling one out a week to make an easy roast chicken with olive oil, salt and pepper or roast chicken over potatoes, garlic and preserved lemon. I prefer to slow-roast whole birds, which yields a beautifully tender meat that falls of the bone with a crisp and salty skin. We save the bones, tuck them into the stockpot with herbs and vegetable scraps to make homemade chicken bone broth (you can get my favorite recipe for it in my cookbook here). If we do it right, one bird can last several meals. The farmers we source our birds from keep them outside, on pasture where the chickens are able to exercise, peck at worms and grubs, and eat fresh forage in addition to supplementary feed. As a result, their meat is richer in fat-soluble vitamins like vitamin A and it also offers a more favorable ratio of omega-3 to omega-6 fatty acids, compared to birds raised indoors with little room to move. You can often find pasture-raised chicken at your local farmers market, or by reaching out to a farmer near you. 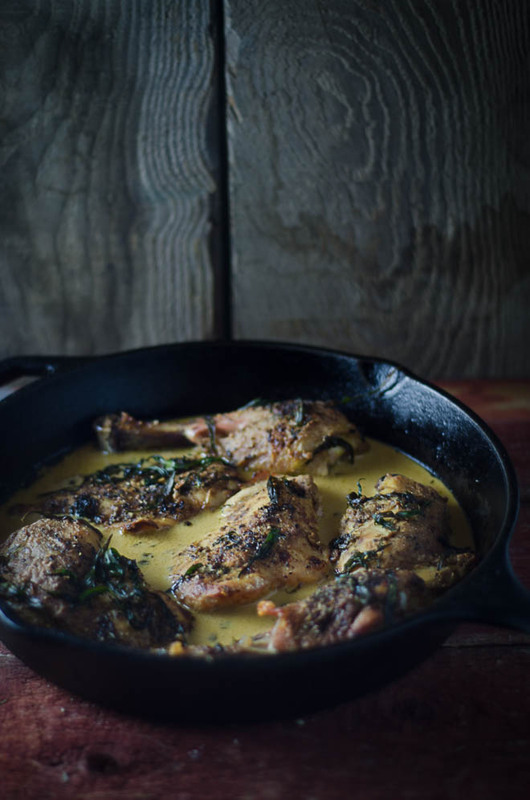 If you can’t find pasture-raised chicken locally, you can also purchase it online here. 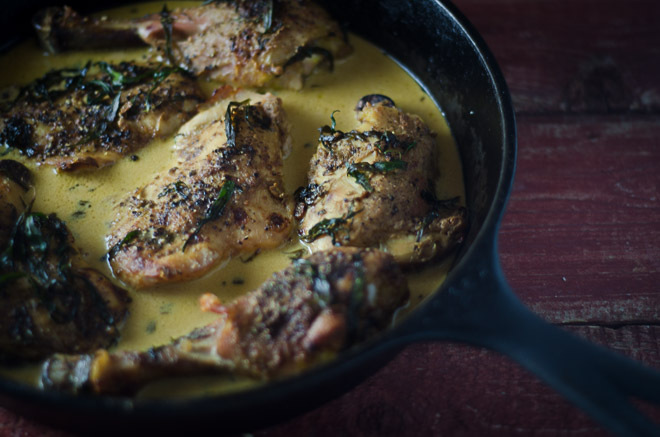 Pan-Roasted Chicken with Cream Sauce, reprinted here with permission from Nourishing Broth, is simple to prepare, but also rich with cream, broth and a sprinkling of tarragon that balances nicely with the sharp sour notes of Dijon-style mustard. If you don't have time to cut up a whole chicken, consider using bone-in chicken breasts or thighs. Cut up the chicken: Separate the legs and thighs, remove the bone from the breasts, and cut the breasts into 2 pieces. Reserve the back and neck for making stock. Place the chicken pieces skin side up in a stainless steel roasting pan. In a small bowl, combine the melted butter and mustard and brush the skin of the chicken with the mixture. Sprinkle with salt and pepper. Strew the tarragon over the top. Bake for about 1 hour, until the chicken is cooked through and browned on the outside. Remove the chicken pieces to a platter and keep them warm. Place the baking pan over medium heat and deglaze the pan with the wine, stir- ring to remove any browned bits from the bottom of the pan. Add the broth, bring to a boil, and boil until reduced by about half. Gradually add the cream and boil to reduce it a little more, until a thick sauce consistency is reached. Season with salt. Strain the sauce into a heated bowl or gravy boat and serve with the chicken. Excerpted from the book Nourishing Brothby Sally Fallon and Kaayla T. Daniels, PhD, CCN. © 2014 by Sally Fallon and Kaayla T. Daniels, PhD, CCN. Reprinted by permission of Grand Central Publishing. All rights reserved. Exactly my thoughts!! Sure would be wonderful to just find a recipe and assign someone to make it, LOL! Ha! My husband!! I pick, and he cooks. Why? He loves to cook and I don’t! Yes, we used a cast iron skillet. Works fine for us. This sounds (and looks) delectable, and very French! This does look like a true-blue keeper. And I’m with Laura. I want that elusive ingredient! I can think of lots of recipes it should be used in….. I adore tarragon with chicken. I’m definitely going to try this recipe. Simple, yet elegant! Is that 1/2 cup cream….it looks like 1-2 cups but that seems like too much.. Yes, it’s 1/2 cup. Thanks for the catch! I copied/pasted this from a word document, and sometimes the formatting gets funky. Omg!!! The best, couldn’t figure out what to make for dinner, and of course trying to do something different AND use what’s on hand, THE BEST!!! So simple! I did cheat and used Greek yogurt instead of cream bc I didn’t have any and added onion and carrots to the cast iron pan. So great!! Even the 2 yr old inhaled dinner with no complaints!! A keeper! This looks amazing! I love the combination of mustard and tarragon. I will for sure be making it soon. Oh, and I wanted to mention that I put your book on the sidebar of my blog because I think it’s awesome!!! Thank you for all you do! This looks amazing. The recipe seems simple and I love the info on the benefits of bone broth! Thanks! My husband wouldn’t stop showering me with compliments! Hahahaaa, and I didn’t crew it up! I made this tonight. You outdid yourself with this recipe. It’s really so simple but we were scraping the pan for drippings. My preschool twins and toddler were having a Babette’s Feast moment. Thanks a million! Any suggestions for non dairy substitute for the cream? I made this tonight, and the sauce was outstanding! I didn’t add the 2 cups of chicken broth because I felt there was plenty of natural juices from the chicken. I used thyme because that’s what I had. I will make again. Thanks for sharing this great recipe! I just wanted to share that this has become a staple in our house now. My family absolutely LOVES it!! I’ve varied it a little depending on what’s available, and each time it’s still turned out great. For example, I used oregano when I didn’t have any tarragon; completely omitted the white wine, when I didn’t have any on hand; and used beef broth when I didn’t have anymore chicken broth. The flavor was a little different each time, but it has become a favorite around here. I finally bought the book about a month or so ago, and every recipe I’ve made from it has been a hit. 😀 Thanks for sharing it!! “pasture-raised chicken locally, you can also purchase it online here.” Link doesn’t work. Would you supply link for pasture-raised chickens again? This is one of our favorite go-to recipes! It’s so rich and flavorful and we’ve had guests tell us they want to drink the sauce 😉 Thank you!